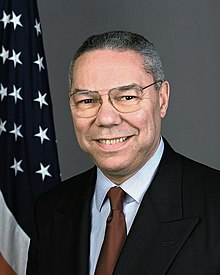 Colin Luther Powell (born Aprile 5, 1937) is an American statesman an a retired fower-starn general in the Unitit States Airmy. ↑ "Biographies of the Secretary of State:Colin Luther Powell". U.S. Department of State, Office of the Historian. Retrieved November 16, 2015. This page wis last eeditit on 18 Mairch 2017, at 18:07.